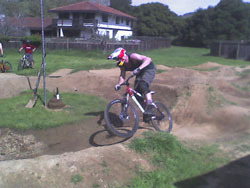 The Mud Blog: Build Your Own Pump Track! Pump tracks are the new rage in mountain biking, as they can be built right in your back yard. Everyone is talking about building them, so here's how to do it! LeeLikesBikes is a website that has great information and sells an e-book called Pump Track Nation. "Pump track mania is sweeping the globe. Mountain bikers everywhere are building endless loops of rollers and berms, and the riders are getting smoother, fitter and faster. These mini tracks teach you to maintain speed â€” no, gain speed â€” over bumps and through tight corners. Almost anyone can ride a pump track. Beginners fumble, jumble and stumble, while experts manual, jump and rip. 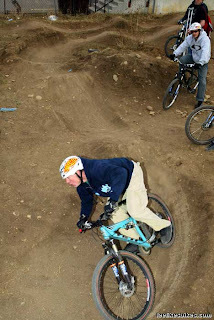 On pump tracks the speed, fear and risk are low, but the effort, fun and improvement are high. Legend has it that Mick Hannah trained extensively on a pump track before he demolished the 2004 Sea Otter Classic. Knowing the fastest Aussies pump on a regular basis, pro downhiller Steve Wentz built a track at The Fix in Boulder, Colo. last fall. At first, his L-shaped loop was barely rideable, but within a week the lines were grooved and the riders were grooving. When I posted a story and videos on this site, pump track reports poured in. The kids in Whistler, BC started building them. The guys at Riding High in Taichung, Taiwan built one. And Ray Petro of Rayâ€™s MTB, the indoor bike park in Cincinnatti, made an awesome one out of wood. Pump tracks are superfun, and theyâ€™re good for you, so you might as well build one of your own. Pick a spot. You can have plenty of fun in as little as 40 x 20 feet. Yes, thatâ€™s the size of your basement. More space means wider turns, bigger rollers and greater speeds. Flat land is best, but you can always rail some downhill berms then pump back uphill on a roller staircase. Oof. Lay it out. Start with the turns. Make them tight enough to pump but not so tight you struggle to make them. A radius of about 75 inches works well. The 38-inch turn at The Fix creates champions but robs speed. Make sure your berms have constant arcs, and build them gradually from flat to vertical. When you get the hang of your track, youâ€™ll be pulling almost three Gs and leaning 70 degrees. Fill in the spaces. Build rollers or doubles between your turns. Avoid flat spots. Every square inch on your track should tilt upward, downward or sideways. No time for coasting!" You can get more info and support Lee Likes Bikes here! Top pic is Nathan Rennie on Mountainzone.com. Next 2 pics are on Leelikesbikes.com.